Economic Development, Sustainability Go Hand-in-Hand for Gonzales, Calif.
Taylor Farms and the City of Gonzales have proved to be a winning combination when it comes to sustainable economic development. The company’s produce processing plant in Gonzales is the city’s largest economic development project to date, employing about 1,000, and it exemplifies the city’s quest for companies that adopt innovative and sustainable practices. In April, Taylor debuted its newest addition to the plant, a cogeneration facility that uses cleaner natural gas to produce power for the facility while running waste heat through a heat exchanger to help chill produce. The cogeneration operation joins a wind turbine and solar panels to provide 90 percent of the plant’s energy needs. Taylor’s sustainability efforts don’t stop with energy usage. Taylor recently launched an aggressive recycling and reuse program that aims to significantly reduce the amount of landfill waste sent out from the plant, with an ultimate target of zero waste. Taylor has also deployed a water recycling process that allows it to reuse water three times in the washing process. Before finally pumping used water out, it is run through cooling towers to help reduce the temperature of incoming fresh water. 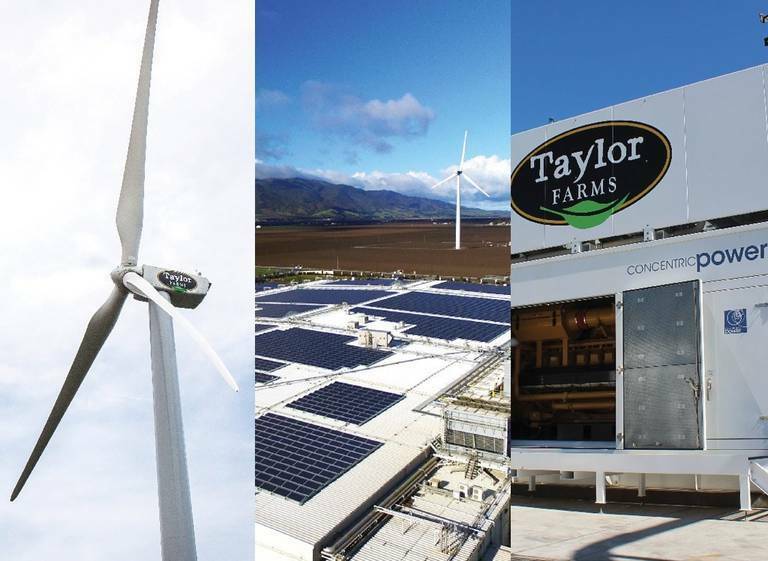 Taylor’s level of dedication to sustainability and to lowering its carbon footprint is still rather rare in the food processing industry. The company hopes to use what it learns in Gonzales throughout its network, which includes 22 facilities around the country and one in Mexico. “As far as we are aware, there is no one else doing anything remotely close to this,” says Nicole Flewell, Taylor’s Director of Sustainability. The fact that all this sustainability activity is taking place in Gonzales is no accident. Rather, it is a testament to the city’s focus on sustainability in its economic development efforts. The city partnered with Taylor in building the wind turbine and has worked to provide swift and efficient project approvals (Gonzales prides itself on running a streamlined and business-friendly development review process that at the same time promotes sustainability). A number of other companies that moved to Gonzales also employ sustainable practices. Gonzales has undertaken several green city projects and efforts under a program called G3 (Gonzales Grows Green). The initiative seeks partnerships with businesses to advance green and sustainable practices while also striving to improve community environmental awareness. A city sustainability team aids companies on green projects, including guidance on obtaining incentives, rebates, and tax credits. The sustainability emphasis certainly hasn’t hurt local economic development. Gonzales has posted Monterey County’s fastest growing tax base for the past several years. Taylor says working with the city has been a rewarding experience. The green advances in Gonzales haven’t gone unnoticed elsewhere. Mandy Brooks, Resource Recovery Manager for Salinas Valley Recycles, which operates the nearby Salinas Valley landfill and related waste collection, recycling and reuse programs, says what’s happening at Taylor specifically and in Gonzales generally can serve as a model for other communities and companies. Using clean and renewable energy is particularly important in vegetable processing, which requires power-hungry refrigeration to chill fresh produce. The Taylor cogeneration project produces 2.25 megawatts of power, which, on average, is enough to supply 64 percent of the plant’s power needs with onsite natural gas that is 21 percent cleaner than energy from the power grid. The wind turbine offsets 16 percent of the plant’s power needs with renewable energy. Solar panels kick in another 10 percent of the plant’s power needs with renewable energy. Total offset: 90 percent of the plant’s needs. On some days, those three sources provide all the energy the plant requires. Those kinds of numbers resonate at Gonzales City Hall, where advances in sustainability that also help the community grow are cherished. Irwin Speizer is a freelance writer and communications consultant based in Monterey, Ca.